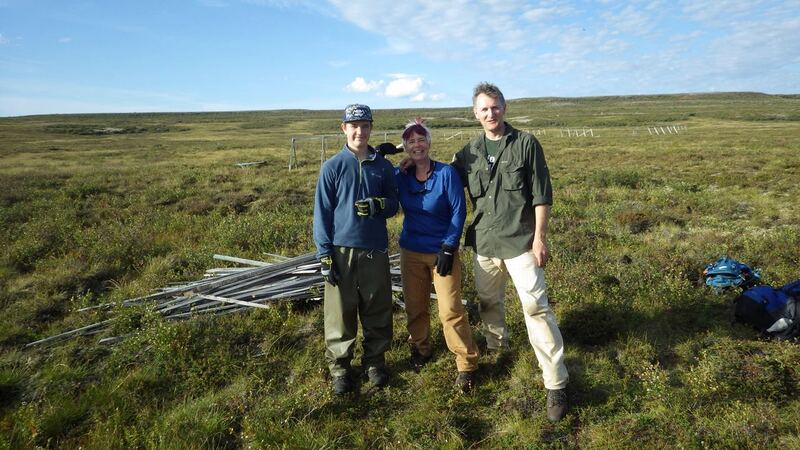 This week on Dispatches from the Field, we welcome Sarah Westrick, a Ph. D. student at University of Michigan who shares her experiences at Squirrel Camp! For more about Sarah, check out her bio at the end of the post. As a biologist, I’m enamored with nature. 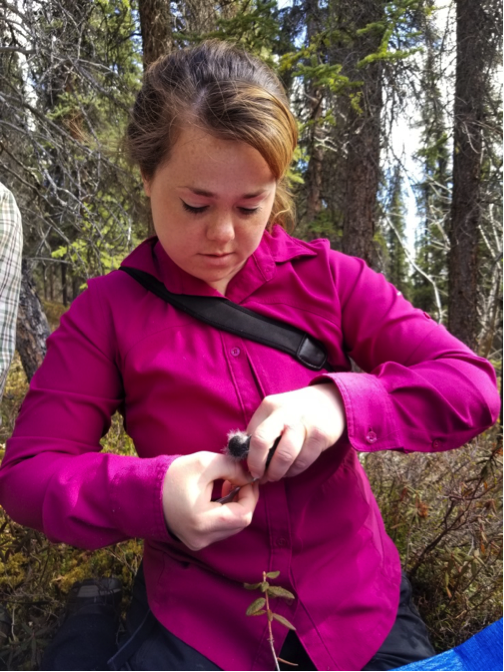 Learning more about the natural world around us is what drew me to the field, and biological fieldwork provides some amazing opportunities for me to connect with the natural world. 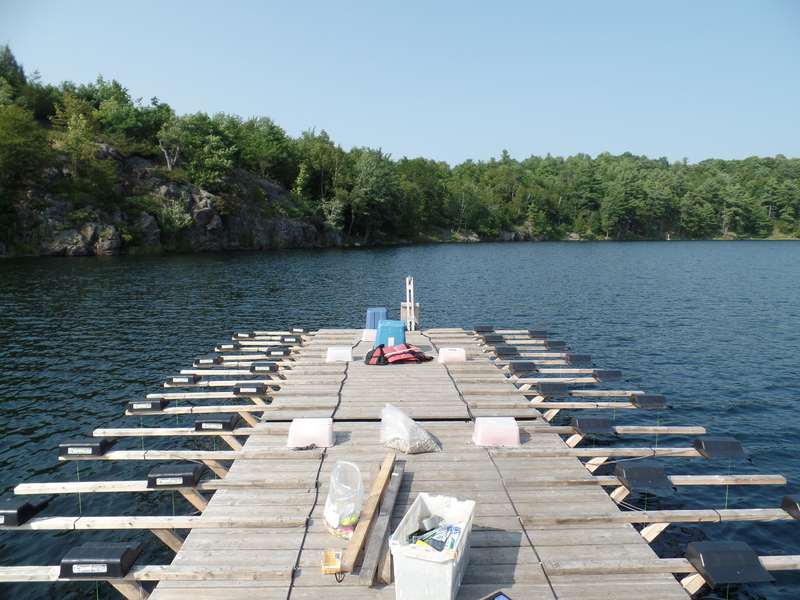 I am lucky to be participating in an incredible long-term field biology program as a third-year PhD student in Dr. Ben Dantzer’s lab at the University of Michigan. 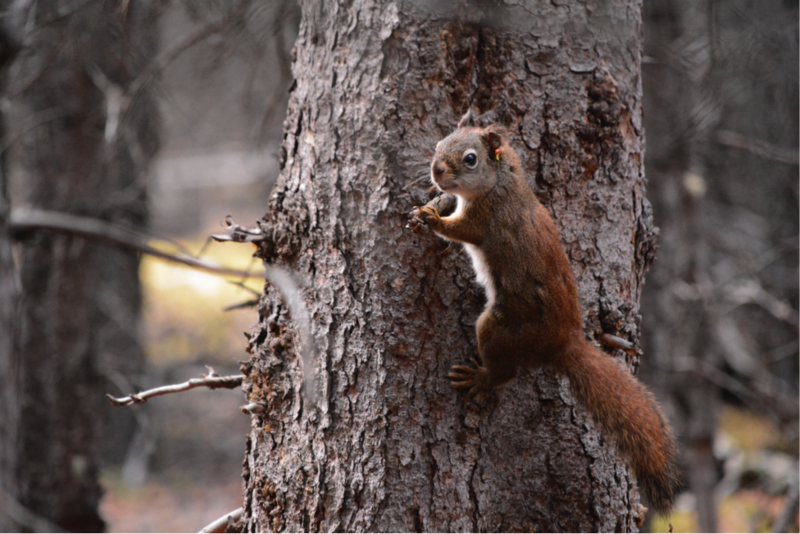 The Kluane Red Squirrel Project (KRSP) is an active research program focused on understanding the ecology, evolution, behavior, and energetics of the North American red squirrel. Since 1987, when Dr. Stan Boutin at University of Alberta established the project, KRSP has grown into a large collaborative effort between the University of Alberta, McGill University, the University of Saskatchewan, the University of Guelph, and the University of Michigan. 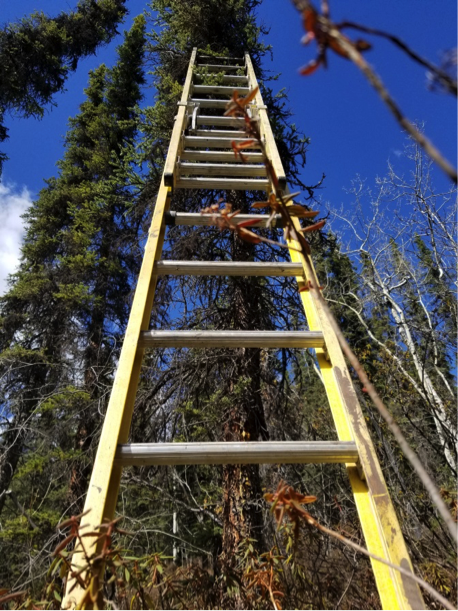 “Squirrel Camp” is our field research site, located in the boreal forest along the Alaska Highway in the Shakwak Trench near Kluane National Park in the Yukon Territory, Canada. 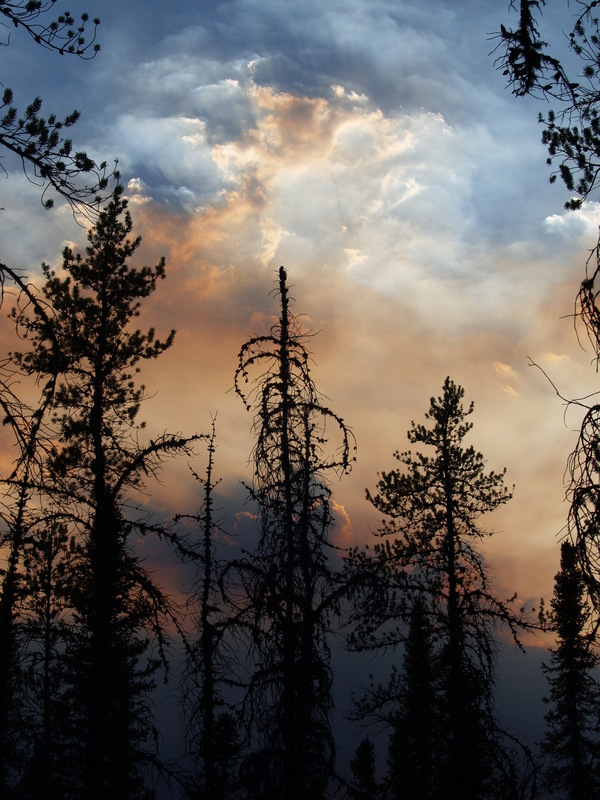 The boreal forest in this region has been studied since the 1970s by researchers on the Kluane Ecological Monitoring Project, including Dr. Boutin, and continues to be well studied by ecologists from all across Canada and the US. Working at Squirrel Camp is an incredible experience for many different reasons. One of my favorite parts of doing fieldwork in this region is the chance to really get to know the land we live on and the ecosystem we work in. When you’re out in the forest every day, you learn about the plants and animals intimately. 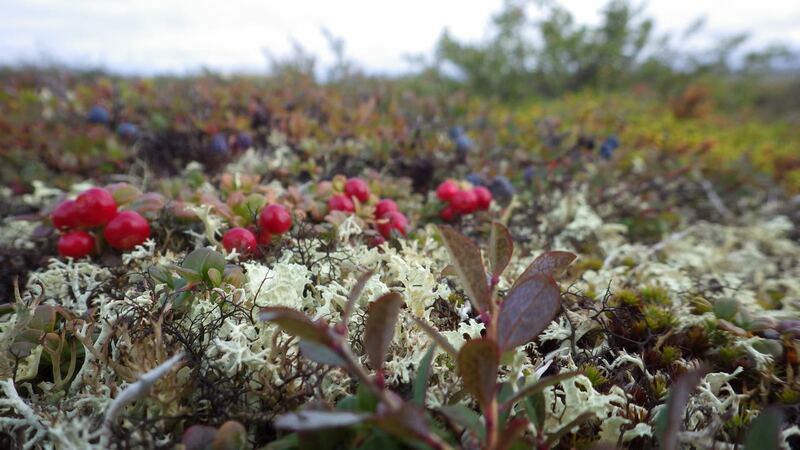 I believe one reason the boreal forest of the Yukon has been studied for so long is its ability to excite ecologists’ natural curiosity. Questions about the ecosystem can come quickly to an inquisitive mind wandering the area. At Squirrel Camp, we have multiple active study grids in the forest. Each morning “squirrelers” head out to their respective grids to monitor the red squirrels living in that patch of forest. Although the grids become familiar old friends, each day when you go into the forest you never know exactly what you’re going to see. You may see arctic ground squirrels alarm calling, encounter goshawks hunting, or accidentally flush out a mother spruce grouse and her chicks. This past summer was my third field season at Squirrel Camp. One day in July, I went out in the forest expecting to have an easy morning live-trapping my target squirrels. 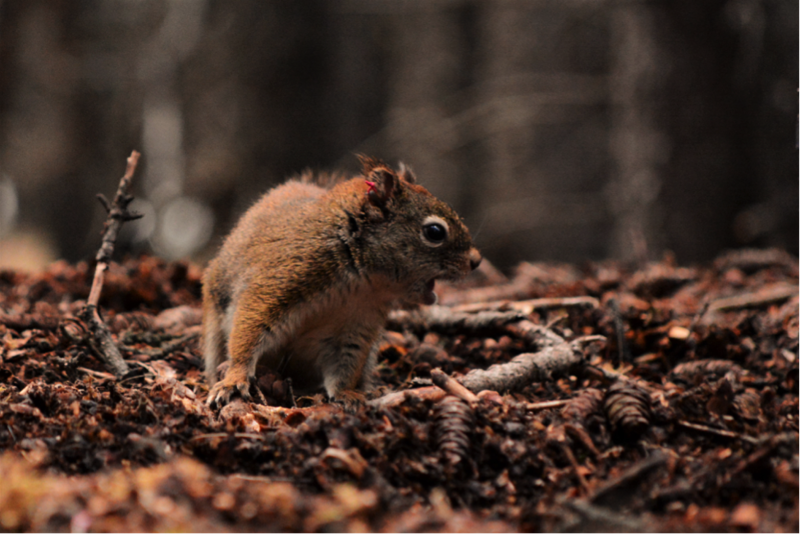 Each squirrel defends its own territory and can typically be trapped there, allowing us to monitor its reproductive status throughout the breeding season. Preoccupied by my thoughts, I moved between two of my trapping locations on autopilot, taking a trail well worn by many squirrelers past. As I neared my destination, I began to hear the familiar barking call of the red squirrel, a common sound in a forest with ~2 squirrels per ha. Not giving it much thought, I continued down the trail. The barks got louder and more frequent. Multiple squirrels joined in the chorus. At this point, I was curious to see who could be causing such a racket and if it meant there was a shift in the red squirrel social neighborhood. My eyes searched the trees for the telltale wiggling branch of a spruce tree or a small furry red tail darting between branches, but I couldn’t find that search image. 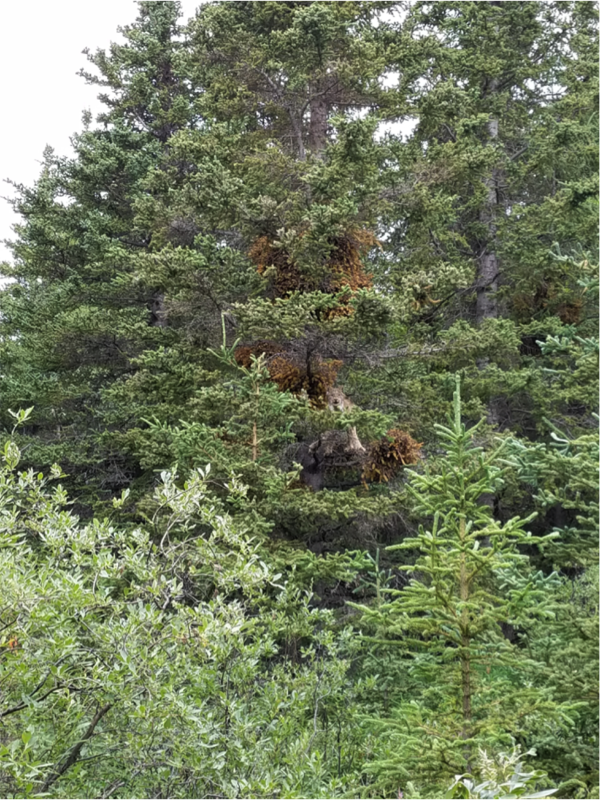 Instead, I found a much larger furry form in a tree about 10 m away: the long legs, tufted ears, and bob tail of a Canadian lynx. I stopped dead in my tracks, staring, and the lynx looked back at me, panting. We took each other’s measure. After a few seconds, with me fumbling for my camera, the lynx decided to move on and jumped out of the tree, trotting into the forest. While seeing lynx from a distance is not uncommon in our forest in the winter, we hardly ever get near this cryptic predator in the summer, as they move with stealth and blend into the trees before we can see them. But while the stealthy lynx is difficult for us to see amidst the leaves and spruce needles, to a squirrel it’s critical to spot a lynx before it ambushes them. After giving the lynx a few seconds to walk away, I approached the tree he was in and found one of our juvenile squirrels frozen atop a witch’s broom in the tree, having narrowly escaped becoming lunch for the lynx. In a nearby tree, his mom was responsible for part of the racket that had attracted my attention in the first place. She was still barking like mad and the neighbors were still in an uproar. It’s not often we squirrel researchers observe a predation event – or a near-miss – and I appreciated being privy to this part of the ecosystem that we rarely get to witness. To top it off, this wasn’t just any random lynx in the boreal forest; this lynx had a blue tag in his right ear. 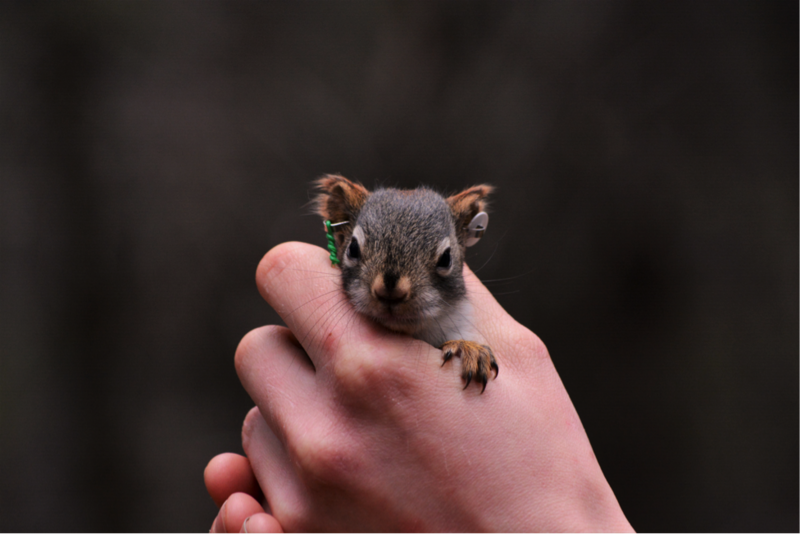 A group of my colleagues at Squirrel Camp had trapped him the previous winter to tag and take a DNA sample. (Squirrel Camp is in fact a multi-purpose field camp: ss our “squirrel season” comes to a close each year in late fall, the Lynx Crew, as we affectionately refer to them – to differentiate them from the Hare Crew (studying snowshoe hares) – moves into camp to track the abundance and behavior of this elusive predator in the ecosystem.) 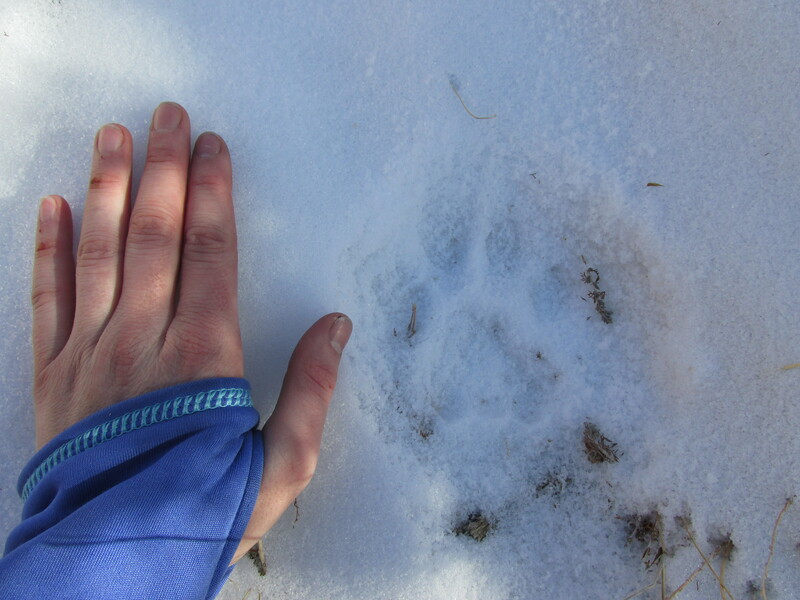 This particular lynx had been followed through the winter farther west down the Alaska Highway, but had since made his way east to our squirrel study grid. To me, this encounter was a reminder to savor the special moments in the forest while doing fieldwork. Even through the stressful, frustrating moments in the field, I can always find some part of the ecosystem to ground me. Not many people are fortunate enough to be in the forest often enough to develop such a connection to the land and the ecosystem. Now I walk the forest with open ears, listening closely to my squirrels, and open eyes, scanning the trees for surprises. 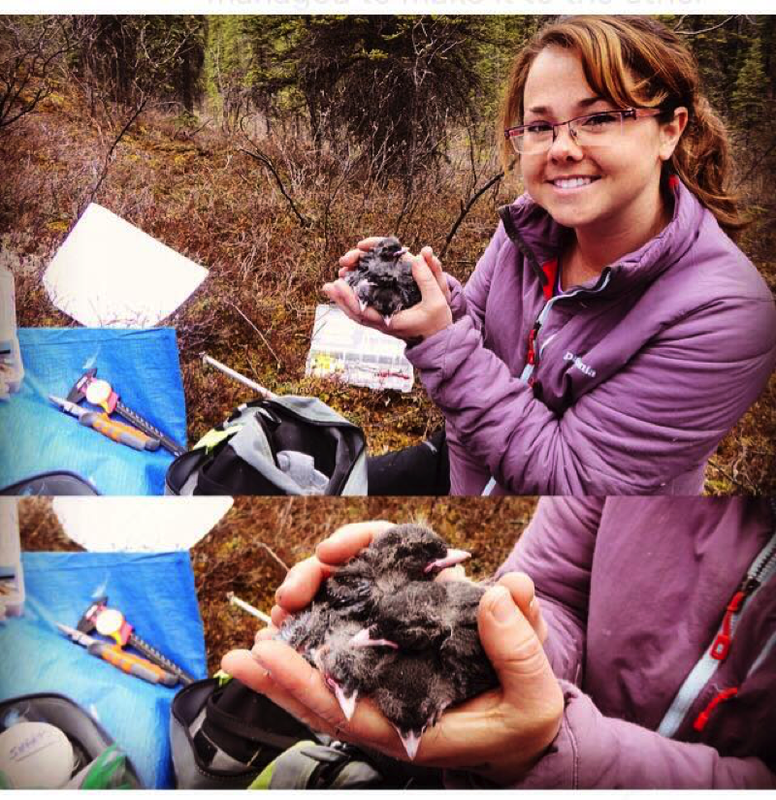 With Canada’s 150th birthday around the corner, Dispatches from the Field is excited to welcome back Emily Williams to talk about her adventures in Alaska searching for Canada’s national bird, the Gray Jay. For more on why the Gray Jay was chosen for Canada’s bird, check out the Canadian Geographic article. For more about Emily, see her bio at the end of this post! The last time I had to do a river crossing to access a nest, in 2011, I got the s*%! scared out of me. I managed to make it to the other side only with the help of the hand that grabbed my arm at lightning speed after it was apparent I had lost my footing and was starting to get swept away by the current. About a month ago, I had to face the fear I’d been harboring since that experience. Compounding this fear was the knowledge that I was residing in a place well known for its fast-flowing, muddied, arctic-temperature waters, where everyone has a story of someone they know that wasn’t so lucky during a seemingly harmless packrafting or fishing trip. If there’s one thing I learned when I was last in Alaska nearly ten years ago that hasn’t changed, it’s this: respect this land, be prepared, and have the humility to know that you are a small, fragile human in a large, harsh, and unforgiving landscape. 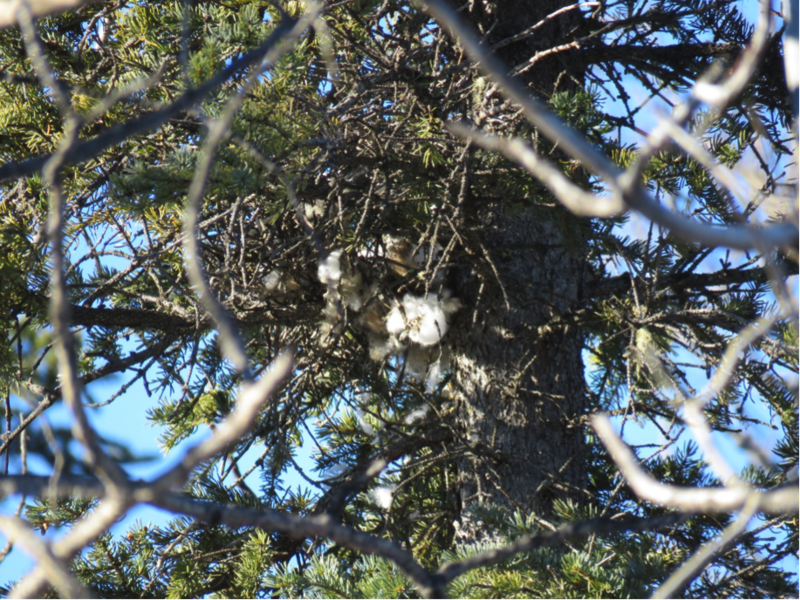 In the middle of May this year, I was wrapping up my first Gray Jay field season and monitoring the last remaining nests that still had nestlings. There was just one nest left to band nestlings at, but it had been eluding me for days. While we generally try to check nests every few days, 10 days had passed since this nest had last been checked. I had the gut feeling that the nestlings hadn’t fallen prey to a predator, because I kept seeing the parents nearby, acting suspicious. But the problem was, when we found the nest back in late March, we had easily accessed it by crossing a frozen creek. Now it was mid-May, and the nest was still across a creek – a creek that was raging at high levels due to the runoff from all the snow we received this winter. I had hiked down to the creek a couple of times already, hoping the water levels had gone down, but to no avail. The next option was to try to access the nest from the other side of the creek. This involved a long six miles of bushwhacking through thick willow and alder, culminating in the realization that that route led us to a place where the creek forked, which took us further away from our goal. The final option was to try to cross the creek. 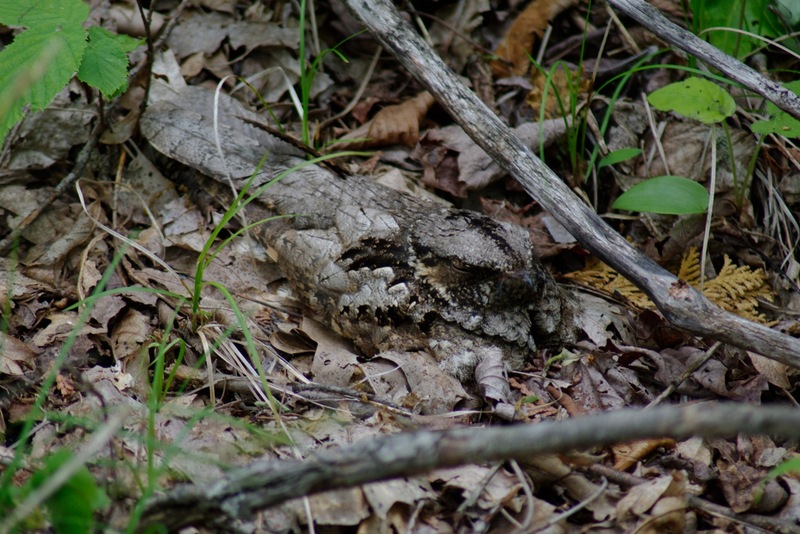 – one to try to cross the creek with, the other to climb up to the nest – in tow, I set out to face this obstacle head on. A few attempts at extending the ladder across the creek and onto the other side ended without coming any closer to achieving a viable crossing – the 25-ft extension ladder just wasn’t long enough. We then scoured up and down the creek sides, looking for a better passage that didn’t seem so swift or deep. After several minutes, we found the spot: the eddies didn’t look nearly as fast or scary, and there was a tree hanging over the width of the creek, offering a steady hand rail for our passage. Doing all the things they teach you about swiftwater crossings – wearing life jackets, attaching ourselves to a rope that another held onto from solid ground, using trekking poles to stabilize us, and crossing together, two sets of feet moving in tandem – we waded into the current, one step at a time. Several nervous, adrenaline-pumping minutes later, we made it to the other side. All social niceties thrown aside, I let out a huge “Whoop!” of relief, allowing all that adrenaline coursing through my veins to slowly seep out into a feeling of triumphant euphoria, knowing I had conquered my long-held fears. It’s amazing how a few nerve-wracking moments can end in such an enormous natural high. After crossing, we gathered our equipment and proceeded towards the nest. And what do you know? We found that nest full of expectant, 13-day old nestlings, throwing their mouths open with reckless abandon in the hopes of being fed a tasty morsel. This nest, pardon my French, was a b%#*! to get to. But seeing all four of those fluff balls sitting there, as if they were waiting on us this whole time, (“it took you long enough!”) made it all worthwhile. 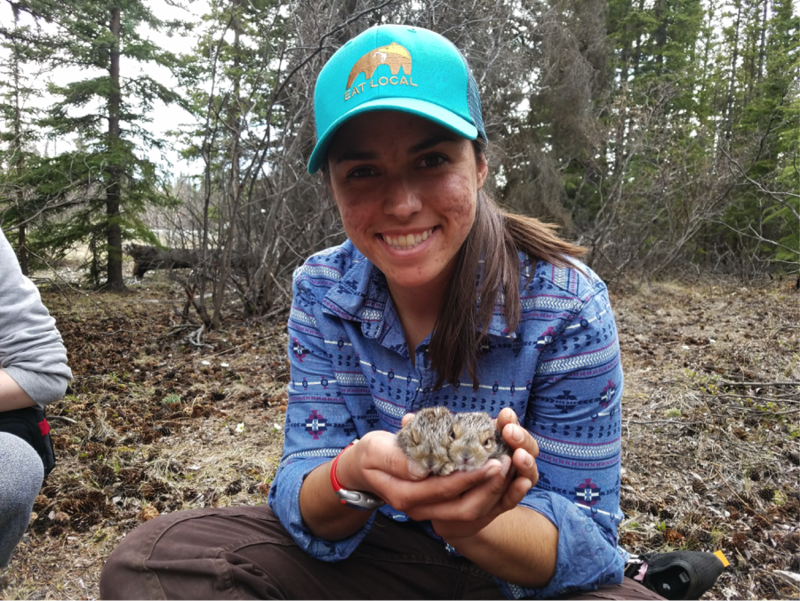 Emily Williams completed her MSc degree at Kansas State University and now works as an Avian Biologist at Denali National Park and Preserve. 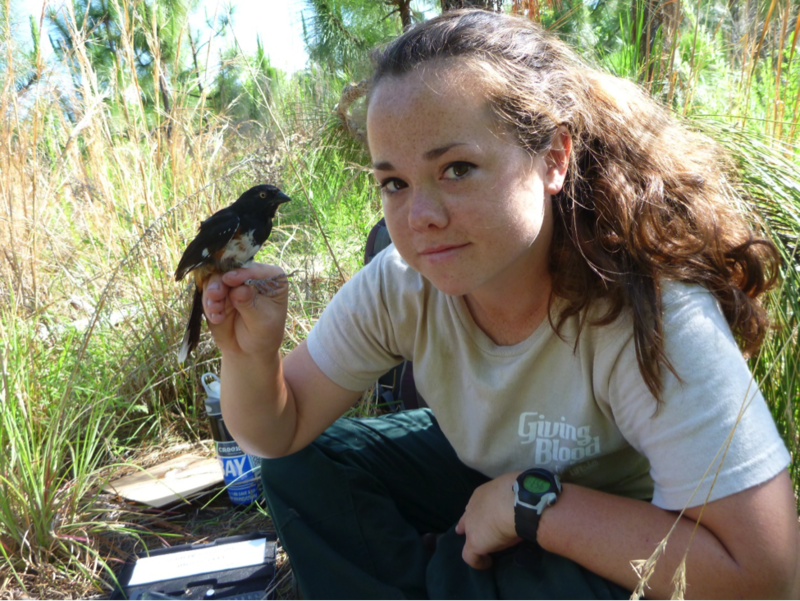 Emily’s research focuses on dispersal and migration ecology of birds. 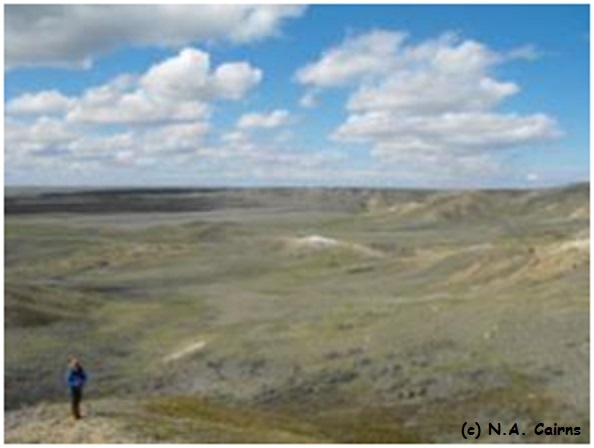 While her heart still remains with the Grasshopper Sparrows of the tallgrass prairie, she is excited to work among the boreal forests chasing Gray Jays and other arctic birds. 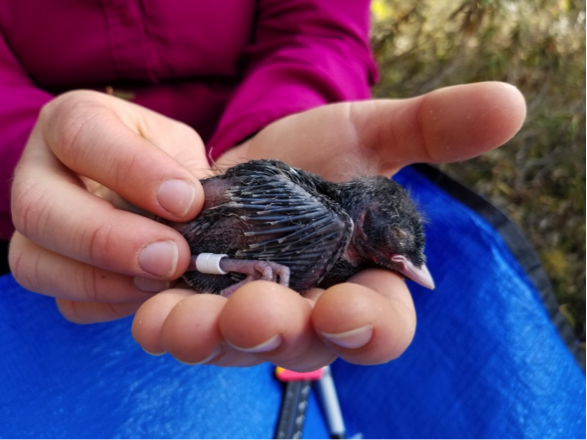 This week on Dispatches from the Field, we welcome Emily Williams, an Avian Biologist who left her warm home in Florida to work at the chilly (might be an understatement) Denali National Park and Preserve. For more about Emily, check out the end of the post! I usually scoff when I hear stereotypes or clichés that are used to generalize people that come from a certain state or region of the country. Beyond a personal aversion to phrases such as “GRITS: Girls Raised in the South,” I am always quick to point out when most people break the stereotypical mold. As a person from Florida, I am no stranger to southern sayings. I’ve heard them my entire life – and can hold my own in a discussion about the differences between being southern, country, or redneck. While I may be from Florida, I often don’t claim my latitudinal roots because I am easily captivated by topography, cool temperatures, and an absence of urban sprawl. If anyone ever attempts to call me a southern belle or a Florida girl, I am quick with a terse response, usually containing an expletive or two. But as much as it makes me cringe to say it, I have to admit that the phrase “Florida girl” – in reference to yours truly – couldn’t ring more true than it has over the past few months while I’ve been living in Alaska. Let’s step back a minute so I can regain some of my last remaining bits of dignity, despite what I just very publicly admitted. 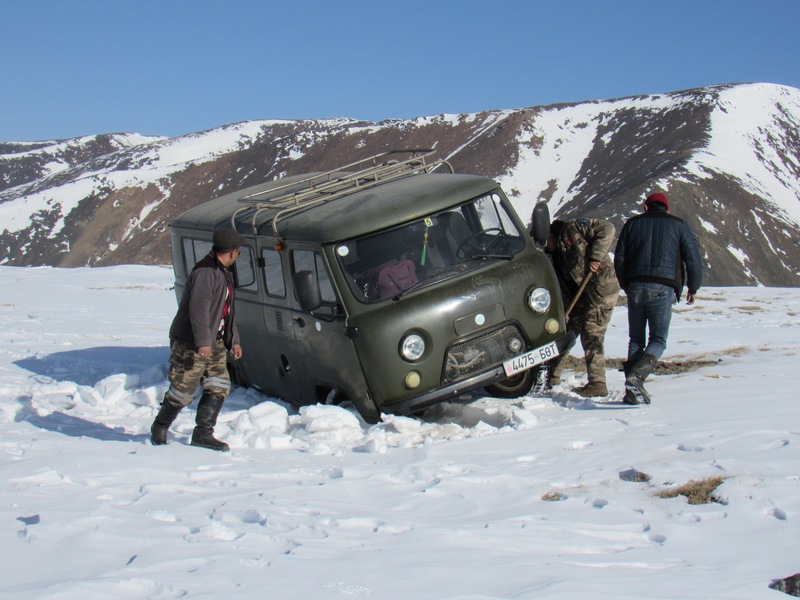 Over the past nine years I’ve been doing field work, I have faced a number of the trials, tribulations, and “less than ideal” conditions that characterize a typical field job, and then some. I’ve found myself in the seed tick and mosquito-infested scrub of Maryland, where not an inch of skin was not red and itchy; I’ve (very stupidly) forded chest-high rushing rivers and cascaded down landslides in Manu National Park, Peru; I’ve careened my way driving stick through 5-o’clock traffic in the heart of Brisbane on the wrong (left) side of the road; I’ve slogged through 10-foot tall grass lugging 50 lbs of trapping equipment; I’ve bartered with capuchins over who would win the revered sheet of toilet paper; and the list goes on. 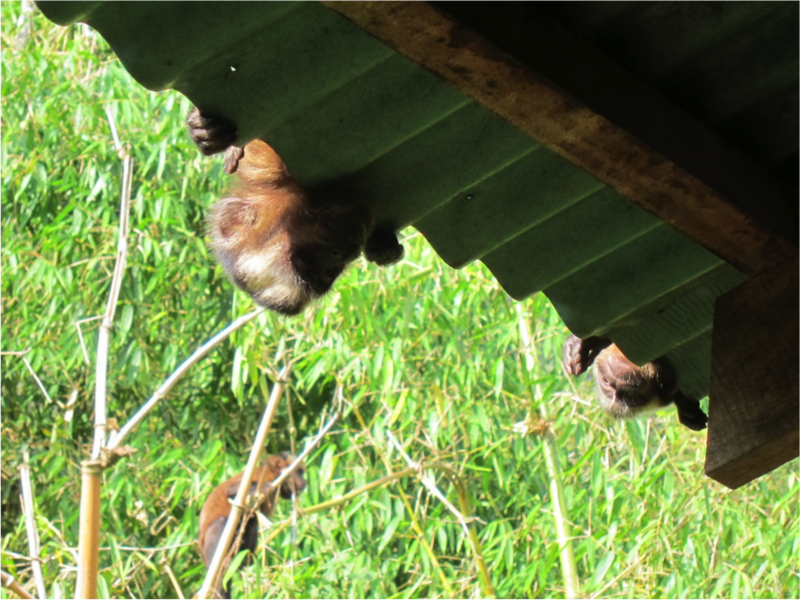 Capuchins were always slinking around our field station in Peru. We frequently caught them stealing our food, in addition to the toilet paper. In each of these situations, while much of the hazardous, chaotic excitement occurred unexpectedly, I usually felt prepared for whatever might come. Most of my friends and family would use those words to describe me: “prepared,” “organized,” “plans everything ahead.” Given these particular traits, I usually can pass as someone who knows a thing or two, or at least as someone who doesn’t act like a noob in a new, foreign environment. Now fast forward to May 2016, when I took a position at Denali National Park and Preserve in Alaska. Being an organized, well prepared person, I had solicited the advice of countless locals, my landlords, my supervisors, coworkers, friends, people off the street, etc. 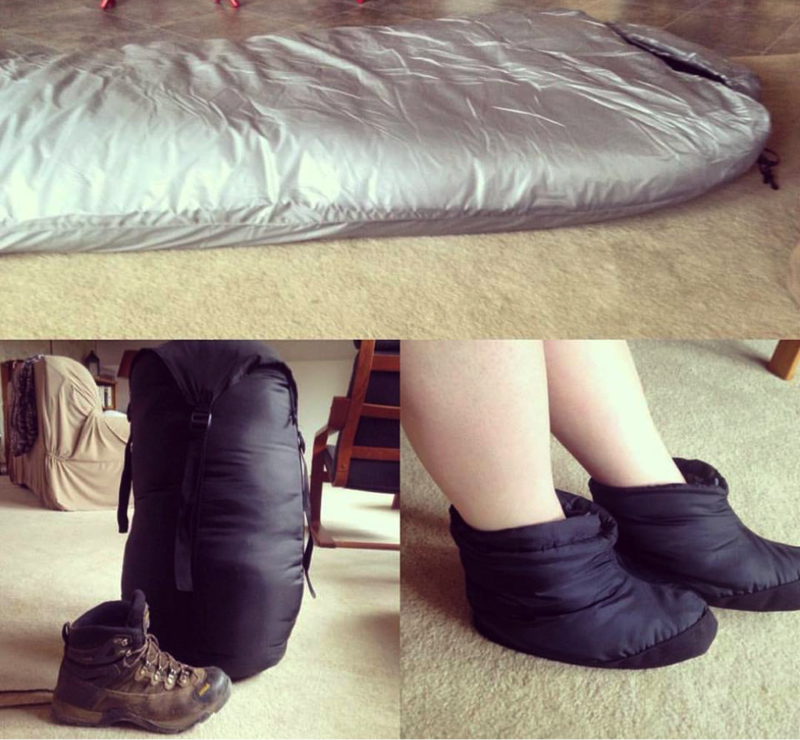 This is a -60◦F sleeping bag I bought as part of my car winter survival kit. You can see it’s huge in comparison to my hiking boot, and stands several inches from the floor. Most guides recommend stocking your car with a sleeping bag in case you get stuck somewhere and have to sleep overnight. The temperature rating should be between -40 and -60◦F to ensure you don’t freeze to death. I also bought down booties to wear for winter camping. – anyone who knew more than I did about life in Alaska, or more specifically, how to survive the winter in Alaska. Knowing that the winter basically begins at the end of September, I figured had roughly four months to prepare (May – August). I had researched several websites and good sources of information about how to prepare a car winter survival kit – which must contain such essential items as a heat source, way to ignite said heat source, and any number of items that in effect guarantee you won’t freeze to death if you happen to plow into a snow bank/slide off the road and get stuck overnight. Alaska, as a state and a culture, has won the hearts of many Americans and people throughout the world, as it has been popularized over the last several years by reality tv shows such as “Bush People,” “Alaska, the Last Frontier,” and “Deadliest Catch” . You also can’t understate the important role Sarah Palin played in bringing Alaska to fame. Several of these “reality” tv shows (and Sarah Palin) trivialize and form a caricature of life in Alaska. Yet, many of the shows’ aspects which highlight preparation for cold, snowy winters and long, sunlight-less days and nights are no joke. 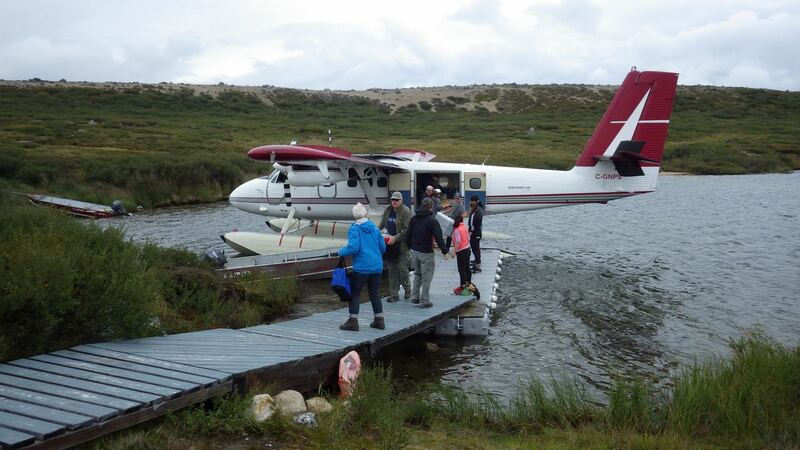 Alaska, true to the cliché, is entirely a land of extremes. In interior Alaska where I live, winter lasts for eight to nine months of the year. Days and weeks of -40◦F are a regular occurrence, and wind chill can cause temperatures to feel like -55 or -65◦F. (The bikini and board short shots of students in front of the University of Alaska-Fairbanks sign proudly displaying -60◦F is really a thing.) The landscape looks like a barren, snowy wasteland: deciduous trees and vegetation are stripped of their foliage, many species of wildlife are hibernating, and everything is blanketed in white. 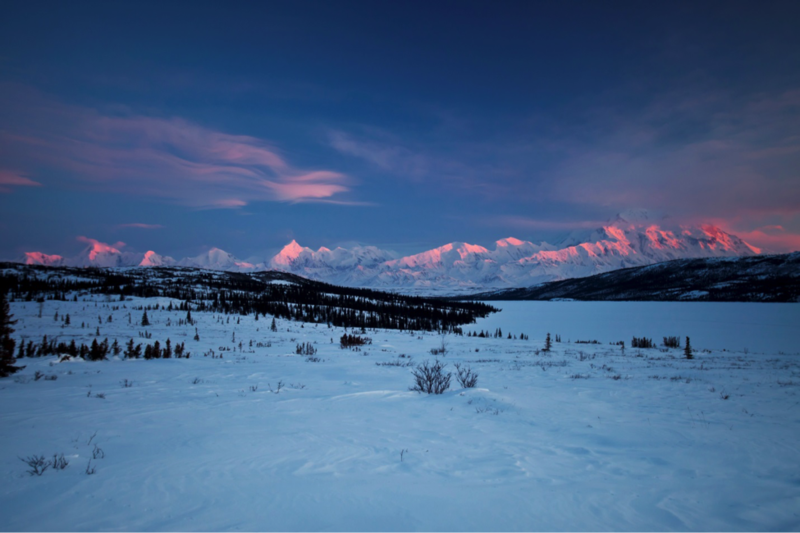 On the shortest day of the year in the Denali area, we receive just under four hours of sunlight. That’s also not to say we don’t experience months of low light before and after Winter Solstice. 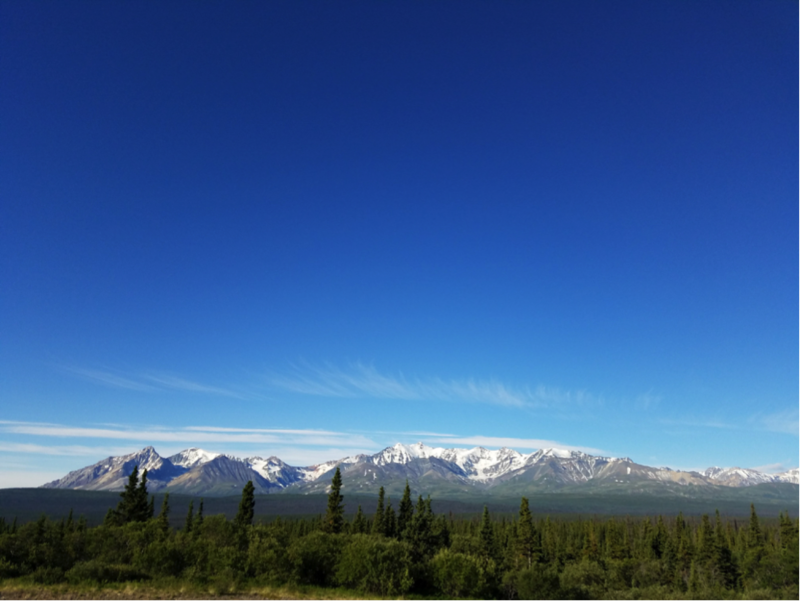 Even the light we do receive is at less than half mast; the angle of the sun is so low in many parts of interior Alaska that it doesn’t reach over mountain tops, causing valleys and anywhere at low elevation to be largely in shadow. While all the research, advice, and hundreds of dollars spent on equipment could help prepare me to some extent, nothing could actually prepare me for truly experiencing winter in Alaska. 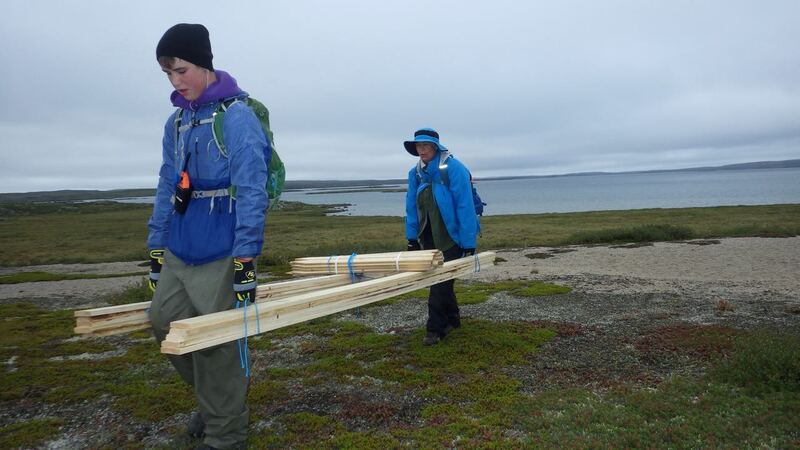 Or, for that matter, conducting my first winter field season – in a subarctic ecosystem. 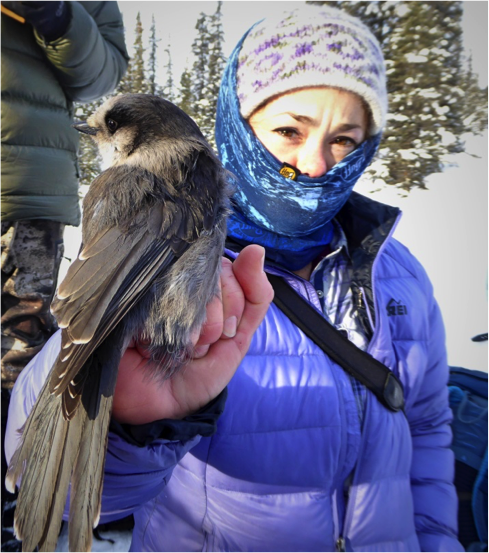 This year the avian ecology program at Denali is piloting a study on Gray Jays – a charismatic denizen of the boreal forest. 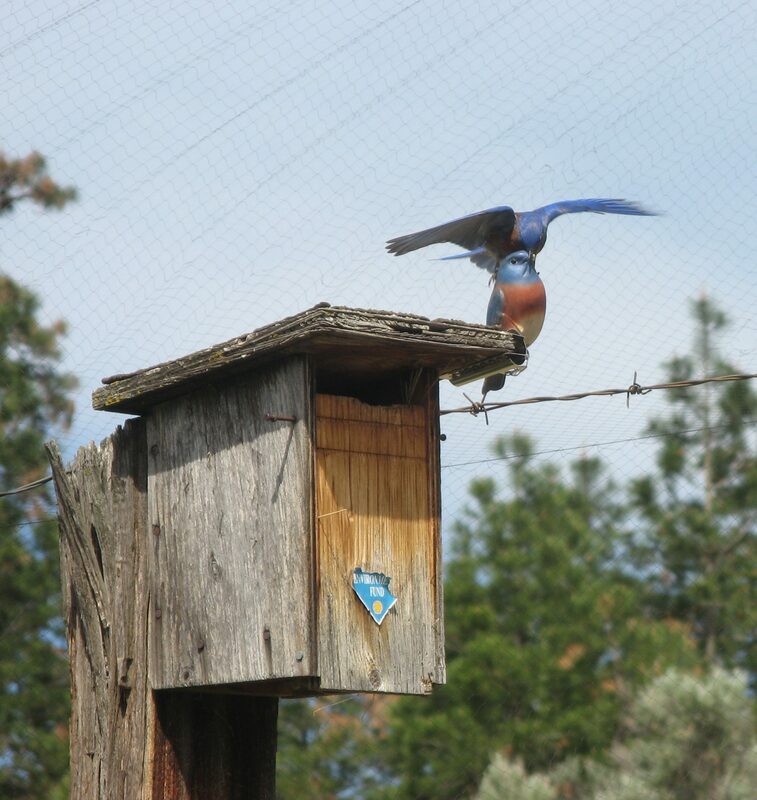 Unlike most birds, which start breeding in April and May, Gray Jays start nest building by late February. Which means that us crazy folks who study these oversized chickadees (in my opinion) must be out there with them – come hell (frozen over) or high water (or snow). 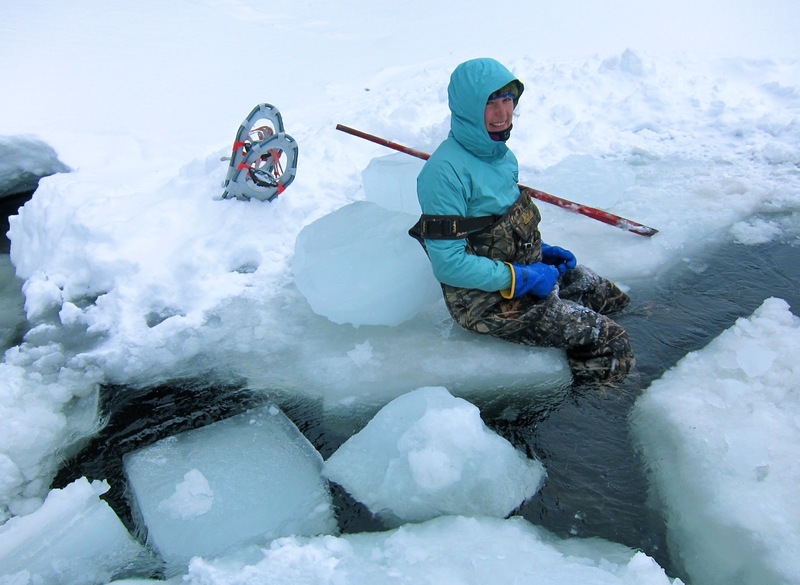 To conduct field work in Alaska during February, March, and April, one must be prepared for all conditions – be it blowing wind and snow directly to the face, -25◦F temperatures (give or take another -5 to -15 degrees with wind chill), freezing rain, or waist-high snow to post-hole in. 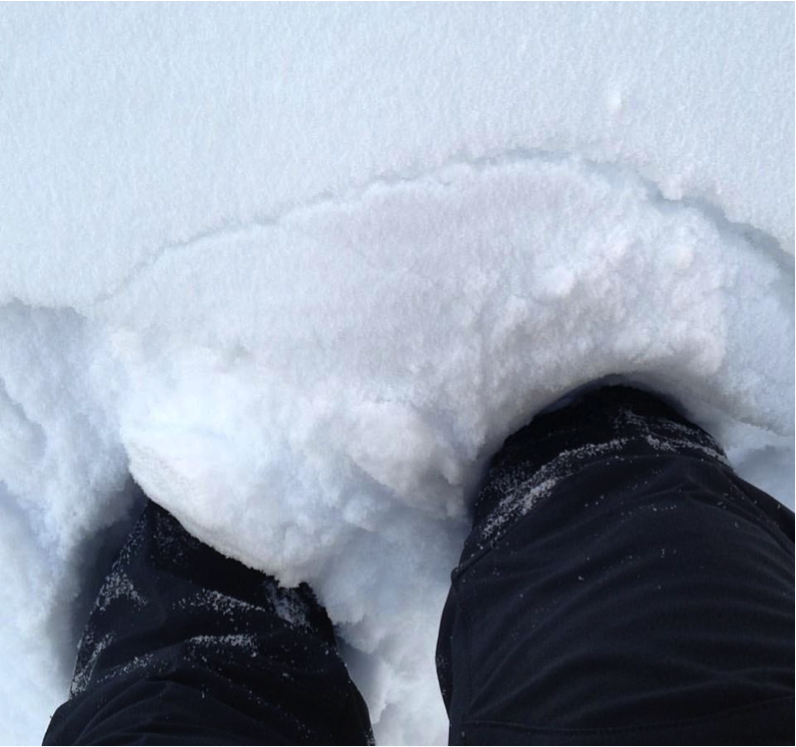 My knees are just above the surface of the snow in this photo. This was before we received an additional two feet of snow a couple of weeks later! While I have researched and talked to many people about how to clothe myself during subzero temperatures, all the talking in the world doesn’t really help, to be honest. There’s really no way to describe what -30◦F feels like until you actually feel it. Each time the temperature gets lower I receive a new experience. How could you know what -40◦F feels like when you’ve only just felt -29◦F?! The best way I have learned what to wear in such temperatures is to go outside, suffer persevere through it, and figure it out. One thing I learned while living here is that there are multiple “weights” to base layers. A summer spent working on wind farms in Wyoming, where it snowed until June and could be bitterly cold and windy, still didn’t instill this knowledge. I naively assumed that one wore long johns and that was it – little did I know that there are sometimes 2, 3, and 4 under layers to choose from! I feel as if most everyone in the lower ’48 told me the best way to prepare for winter is to layer up. Layer, layer, layer. However, what I didn’t realize is that layering can also sink you. Dressing to stay warm for subzero temperatures while also doing strenuous activity is a constant balancing act; one must walk a tenuous tightrope between trying to be warm, but not too warm. 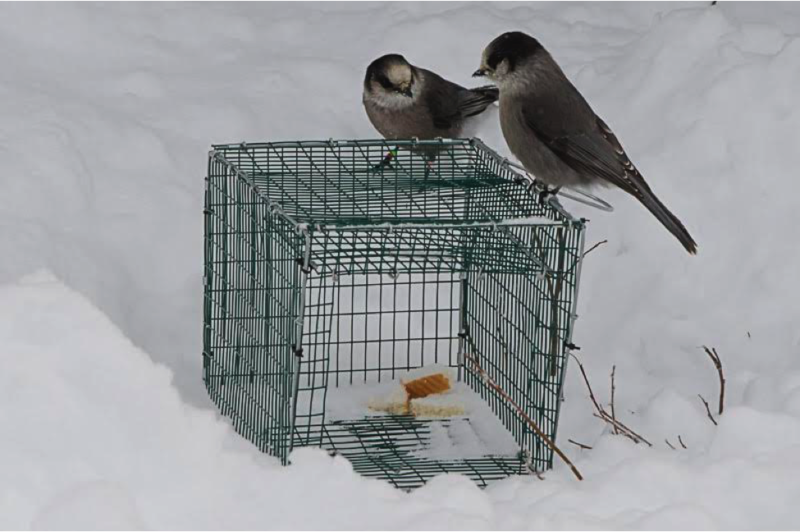 Two Gray Jays having a discussion about whether to pursue the delicious bread inside the Potter trap. Photo by John Marzluff. Field work at Denali during this time of year involves snowshoeing on mountainous terrain that is oftentimes more uphill than downhill – which can quickly cause you to sweat (despite the -20◦F surroundings!). 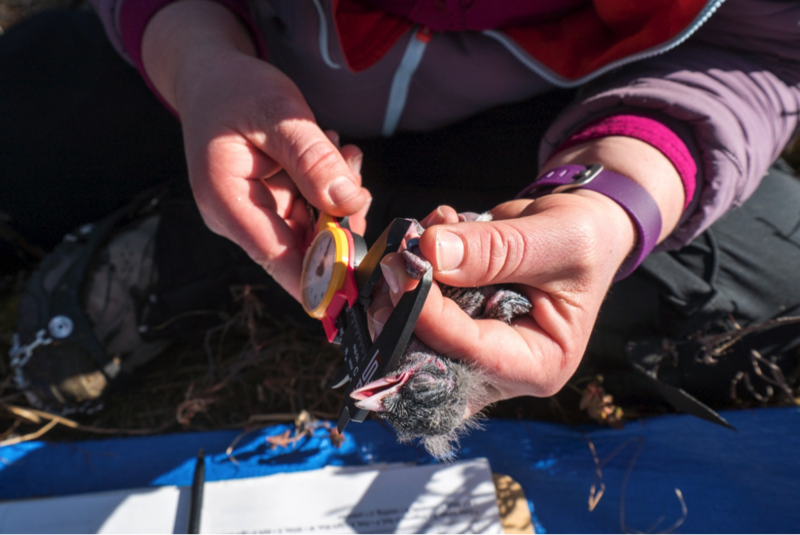 Working with Gray Jays and trying to find their nests means that bursts of strenuous hiking are broken up by hours-long periods of standing still, making observations. Winter trapping of Gray Jays involves much more clothing than I am generally used to wearing when capturing birds: most days only my eyes are exposed. Wearing too many layers in such cases can swiftly cause you to become hypothermic, as all that sweat acts to cool your body down. Wearing down, which I previously had been told was the warmest jacket material, only compounds this problem. Sweat can cause down to get wet – so that all the magical insulating properties of down feathers are virtually rendered useless, and ultimately only serve to make you colder. Another hard lesson I had to learn by living it was that cold temperatures make things freeze. Who knew?! Having never had to think about it before, I left my full Nalgene of water secured in my backpack in the field vehicle one night. The next morning, when I went to grab my bottle, I ended up grabbing just the top lid – the lid had broken cleanly off from the rest of the bottle! The water within had expanded during the freezing process and completely burst the bottle. Of course, as the structural integrity of the Nalgene had been compromised, my pack was now covered in thousands of tiny crystals of ice, which meant that I had to air out (in a heated room) all the contents of my bag. Along these same lines, after a frozen salad incident subsequently concluding in a very hangry biologist, I learned to keep field food (and water!) insulated in my pack. This is just a small sample of the lessons I’ve had to learn the hard way during my first winter field season in Alaska. 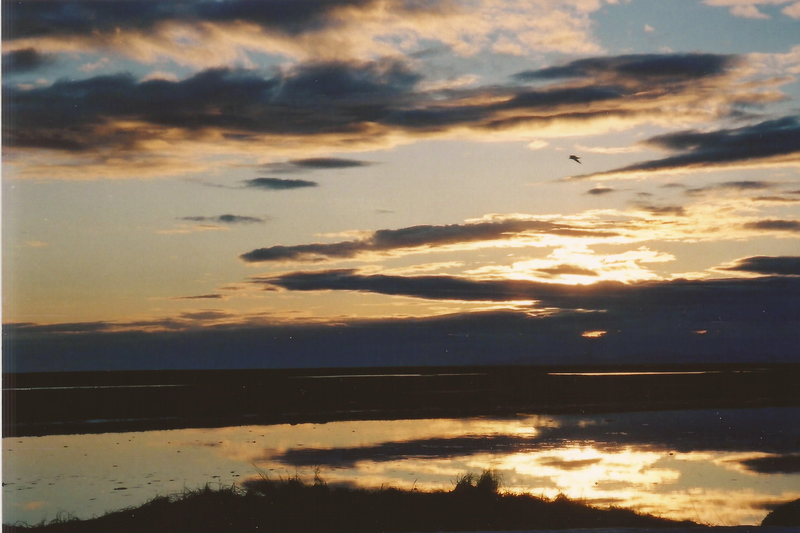 While I have chiefly highlighted the harshness of living and working in Alaska for this blog post, I cannot emphasize enough how amazingly beautiful this place is. I count my lucky stars every day that I have been granted such an amazing opportunity to live and work in a place such as Denali. The good stories full of nights of aurora borealis gazing, cool, quiet mornings listening to birdsong, unexpected encounters with wolves, and quirky Alaska-isms far outweigh the bad. While my usual, overprepared self had many growing pains and much knowledge to gain this year, I am sure there will be many more adventures to come for this Florida girl digging life in the Great White North of Alaska. Opinions on this blog post are my own and do not reflect that of the National Park Service. 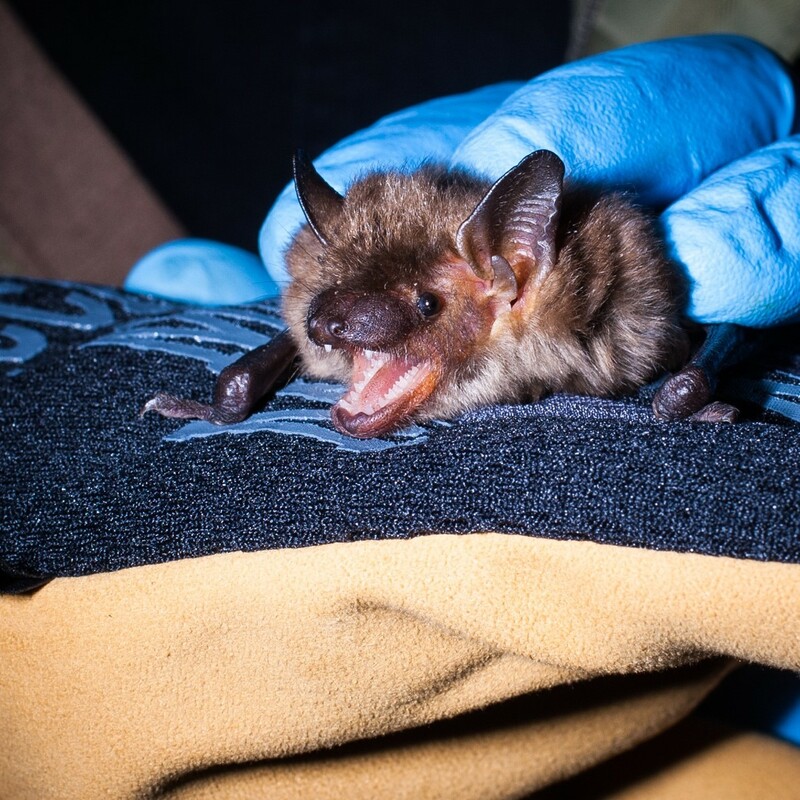 This week, Dispatches from the Field is excited to welcome guest blogger Dr. Kathryn Hargan, who fills us in on what field biologists do when they can’t do field biology! For more about Dr. Hargan, see her bio at the end of this post. Hone your photography skills and creative abilities. How often are you placed in a beautiful setting with infinite time (i.e. days to weeks) to explore? Once you have taken the classic landscape shots, it’s time to take it to the next step. I highly recommend picking a theme for your non-field work photos, for example, rocks, ice, houses, community dogs, etc. In 2014, my field colleague, John, decided it was going to be skulls. Good thing John had a strong knowledge of this macabre subject, because at first my anatomy knowledge failed me – who knew seals and dogs can be confused? 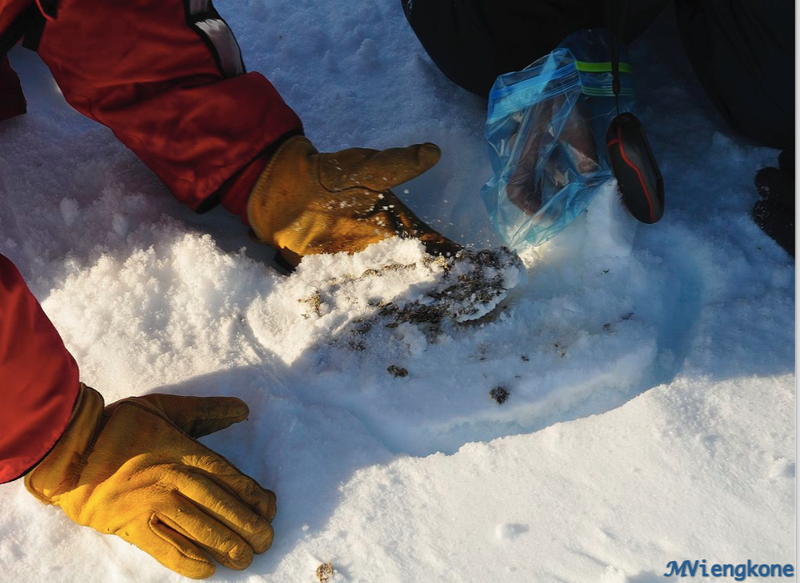 But generally speaking, in the Arctic you see lots of different sets of bones that are decaying but not necessary fully rotting, from a whole variety of charismatic animals – caribou, belugas, bowhead whales, seals, and lemmings, to name just a few. If you’re not into slightly weird pictures, you know those iconic jumping and yoga photos that everyone has? This is the time to take ‘em! The field crew jumping on a cliff, or perhaps a 6 ft man in intense hiking shoes and a rain jacket preforming some yoga on the sea ice? And then finally take lots of photos of the culprit that is preventing your field work – weather, fog, or blasted ice pack! If you return to the same field location year-after-year than you can start to line up the photos by date and see how drastically different one year can be from the next. 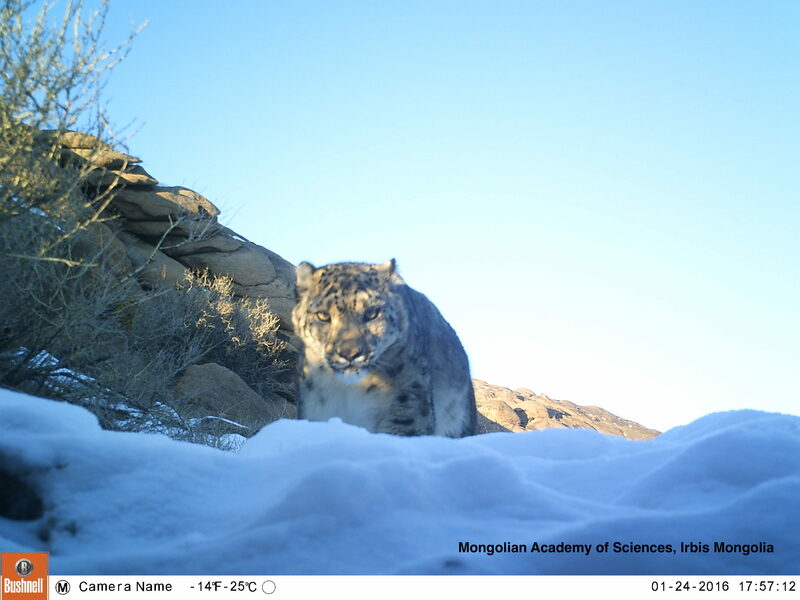 I really find that looking back at all these photos provides me with a lot of entertainment and makes me forget the stress of missing valuable field work opportunities. Fieldwork on pause? Try taking up a hobby…like skull photography (left) or ice yoga (right). Learn something new from someone else. 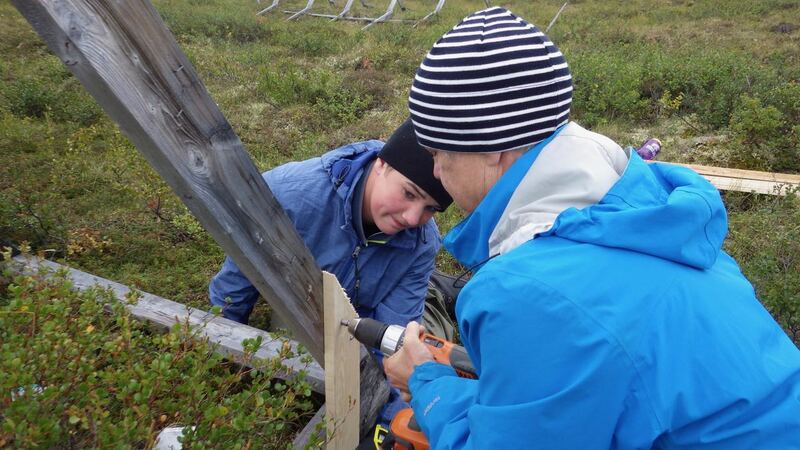 I have been very fortunate to be “stuck” in the north with botanists. 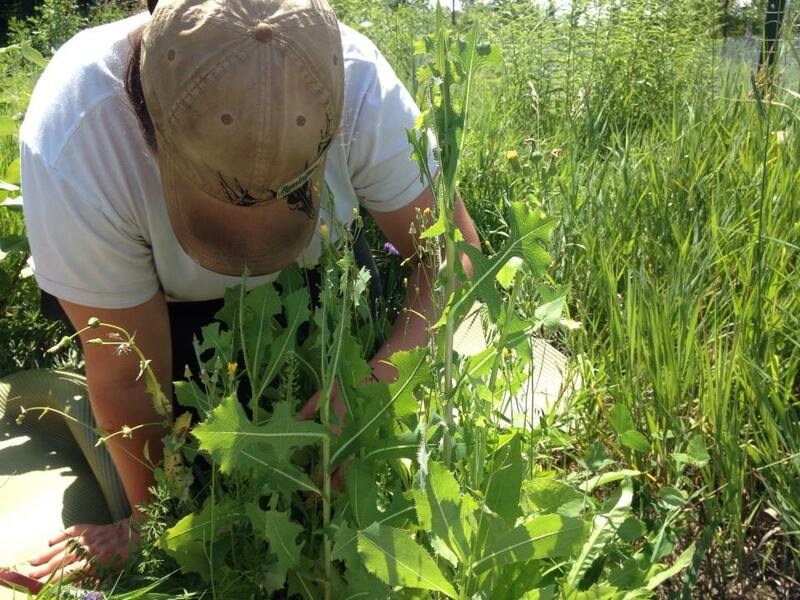 Just about anywhere you go, there are plants, and so really, no field season is a complete disappointment to them. When all else fails – ID plants! 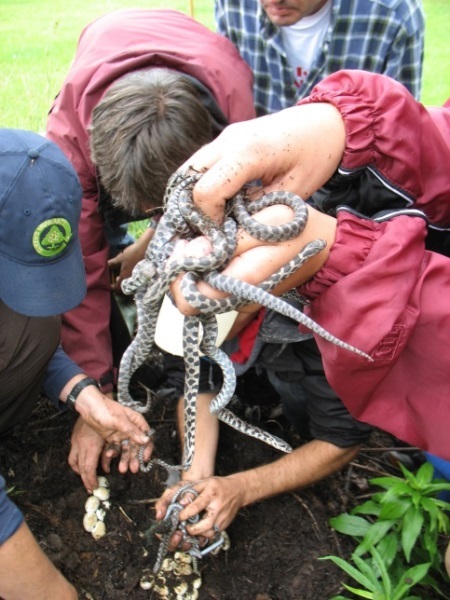 Can’t find your study animal – ID plants! Can’t get to that lake – ID plants! 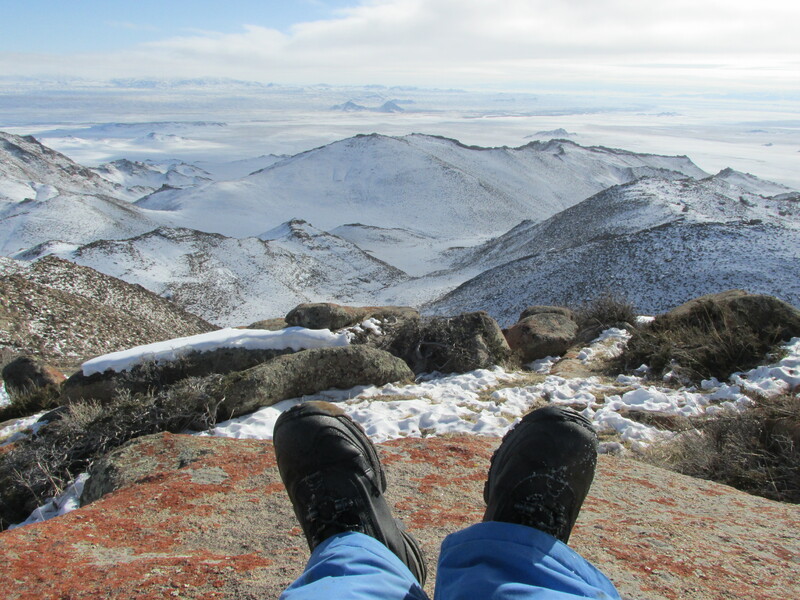 Though, I apologize if you do winter field work – ID…those clouds?! My favourite plant from 2015 is the Hairy lousewort (Pedicularis hirsute) and actually may have become my photo theme – it’s not common and quite rewarding when found. I recently learnt that there is a Woolly lousewort in the western Arctic, and as the name suggests it has more hair than the Hairy lousewort! One day, I will devise a plan to sample lakes in the NWT. 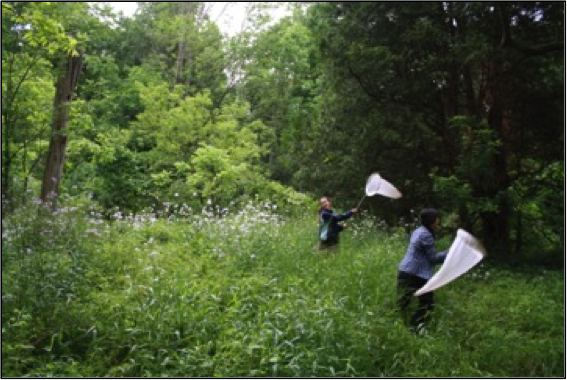 But seriously, if there are not botanists around, most scientists tend to harbor a pool of information on something outside of their field that should be gleaned. A close-up of the aptly name hairy lousewort (right), and most rewarding lousewort patch I found in the summer of 2015 (right). While maintaining a positive outlook that you will eventually start field work, it is only logical that you gain some extra ‘energy’ stores. Of course, these stores will be burned off later when you are putting in long hours and making up for lost time. Also, when we are cold, we eat. Typically, there is no shortage of flour, sugar and butter in northern communities (ketchup is another story! 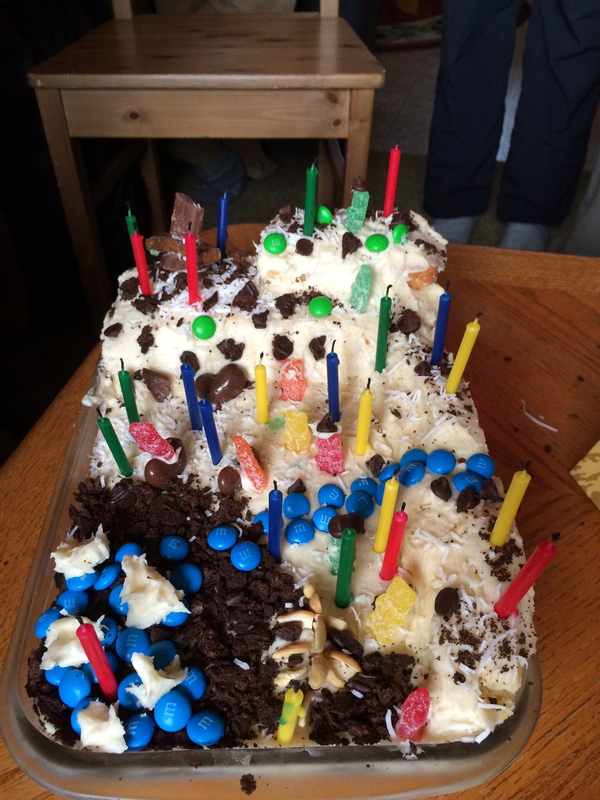 ), and so time can be passed whipping up biscuits, croissants, shortcake, brownies and themed cakes. If you don’t have a stove or microwave, even experimenting with new combinations of food (e.g., nutella and peanut butter pair well with many things!) is an amusing option. I have to say that although I really enjoy the remoteness of northern field work, we don’t often get to be fully immersed in a community. This changed in 2015 when our team was in Cape Dorset for over two weeks. We got to participate in Nunavut Day –a festive town parade and games for ALL ages – including toddler races – so cute! Daily trips to the grocery stores and evening strolls around town meant that we got to know many members of the community. 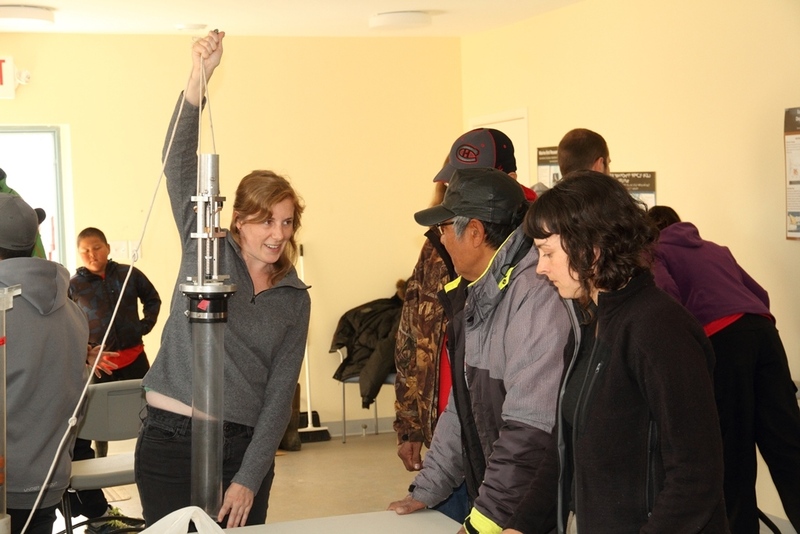 We made friends with a group of children that would always know where we were and even call the house to ask if we could “play out.” Our extended stay in the community also meant that we could organize an information session on our research, and demonstrate how to use our equipment – believe it or not, the sediment corer caught the eye of some. 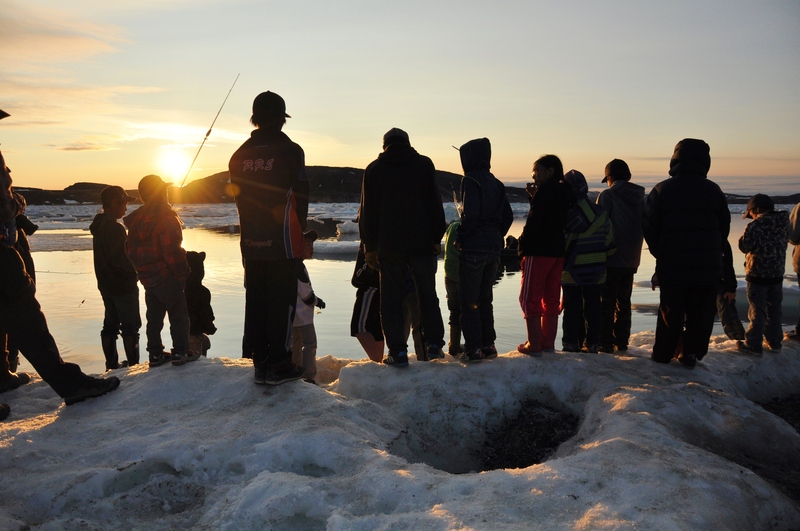 Cape Dorset youth at sunset. So, those are my main points, but of course I have left out some of the obvious. We do watch TV and bad movies when we can’t work – 2015 is the first year I ever watched Shark Week and I probably saw every show twice. We also unknowingly used up the last of our internet watching origami instructional videos. And yes, we do spend a lot of time talking about the weather and brainstorming wild ways to make it improve. Hopefully you never have to employ any of the above, but if you do, maybe now you will have some new inspirational ideas. 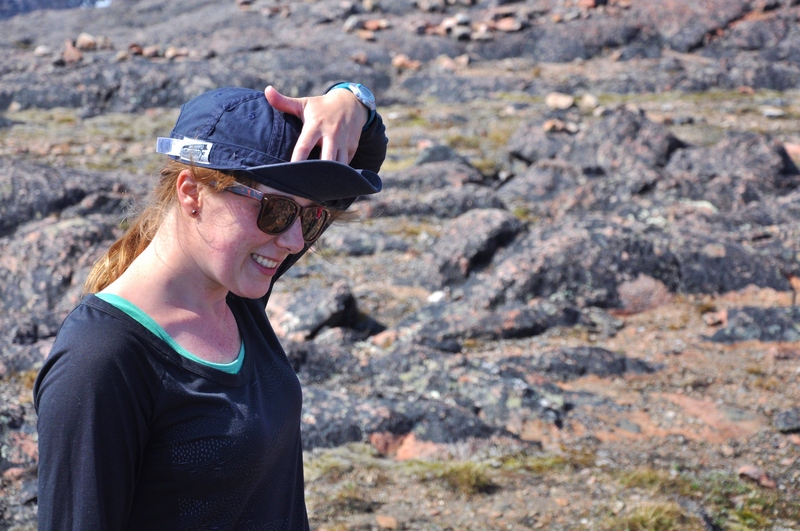 Kat, sporting a rally cap and the belief that field season could still be victorious late in the game (and it was!). 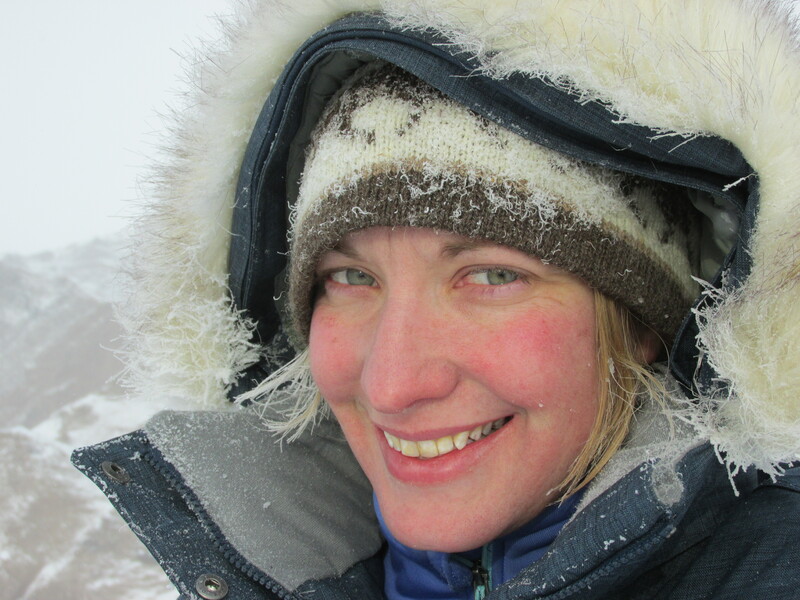 Kathryn Hargan is currently a W. Garfield Weston postdoctoral fellow at the University of Ottawa. 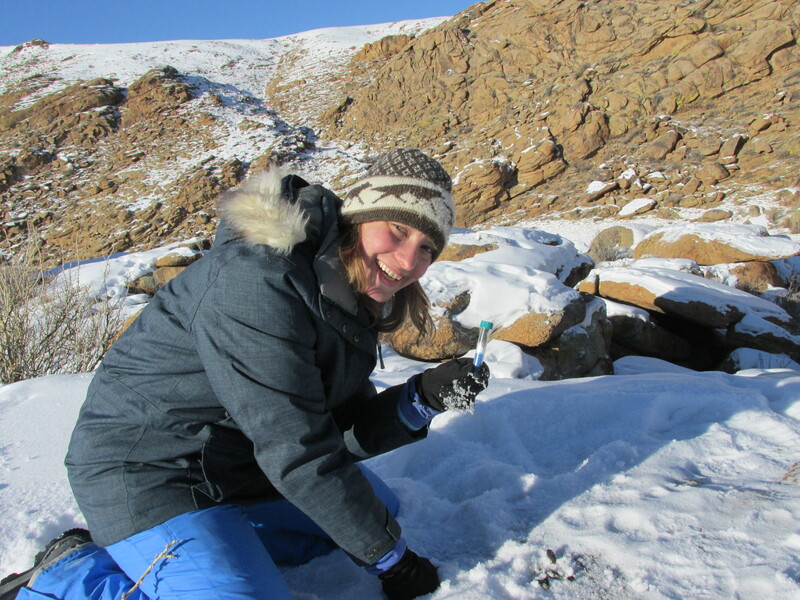 She finished her PhD in 2014 in PEARL at Queen’s University looking at environmental changes in the Hudson Bay Lowlands. 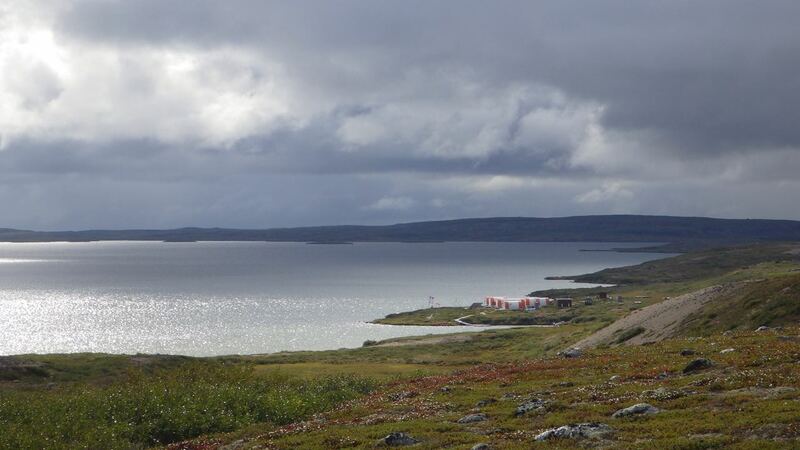 Since then she has shifted her research focus to the eastern Hudson Bay and understanding the importance of seabirds as biovectors in the Arctic.